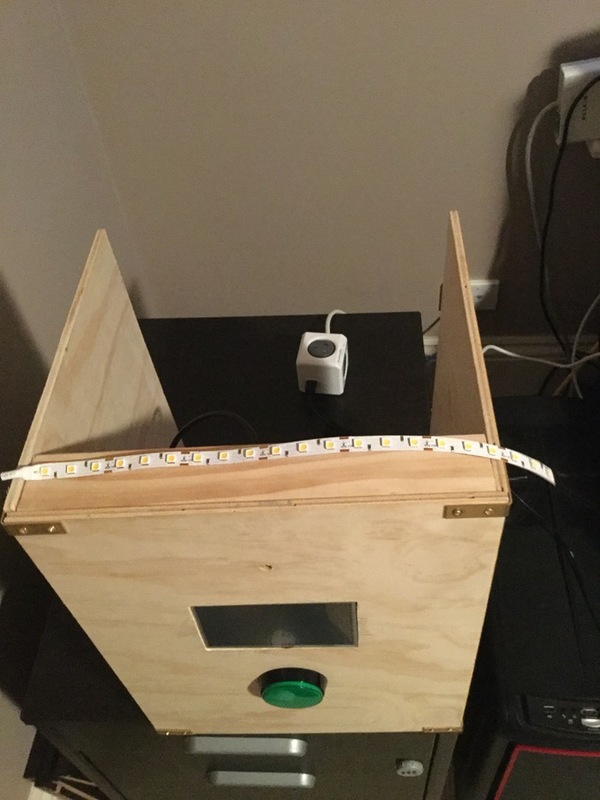 The steps I took in attaching a 12v LED strip to my photo booth. I am using (warm) white colour LEDS. Pair of barrel connectors (these came with my lights, but are optional. If you have never worked with LED strip lights before, they are really quite an interesting component. The LED strips come in various flavours (RGB or White; Waterproof or Otherwise; …etc. ), densities, levels of brightness, and levels of quality. Common to all LED strips are dotted line markings which will occur at various intervals, indicating where you are able to cut the strip. You must only cut the strip along the dotted lines. Measure the width of the photo booth, and cut the strip at the appropriate length. The dotted lines indicate where you can cut the strip into smaller segments. LEDs have a very low resistance - and as a rule, you should never connect an LED directly to a power supply without the inclusion of a resistor within the circuit. 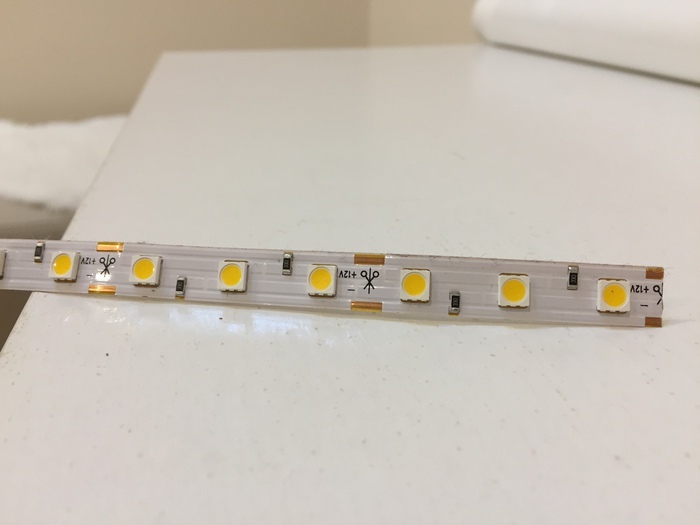 However - most LED strips will already include the necessary resistors as part of the strip, which means you don’t have to worry. We can check for the presence of such resistors by attaching the LEDs to a multimeter in resistance mode (Ω). You should always get in the habit of testing your circuits early. In this case, we should test that our LED strip lights up when connected to power. This will also allow you to determine the lights’ brightness, which may influence your design. If your lights don’t illuminate, check that you have the +ve and -ve connected to the correct terminals. Based on the brightness of my lights, I was keen to ensure that the LED Lights would deflect off my wooden “flash diffuser” rather than being pointed directly at the user of the photo booth. Regardless of your decision in this regard, you will need to drill a hole that will allow your hookup wires to connect up with the rest of the circuit. The mounting position for the lights. Attach some hookup wires to your LED strip. For obvious reasons, you want to attach these hookup wires before the LEDs are mounted on the booth. Give your iron a few minutes to heat up to temperature. 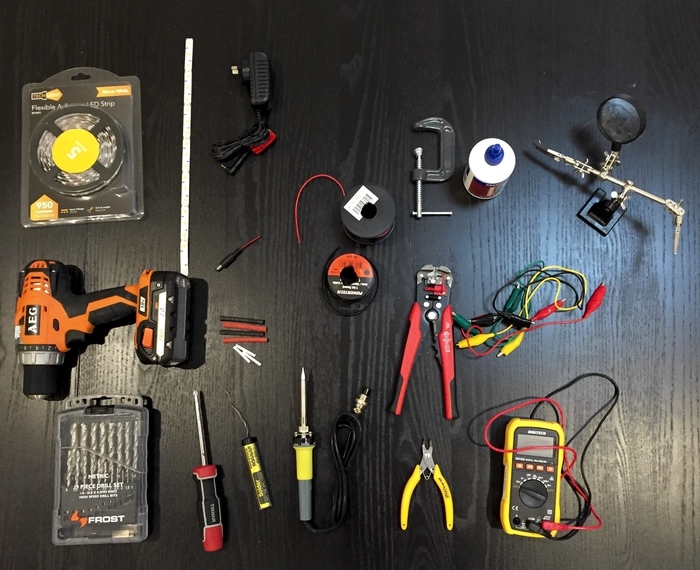 A “helping hands” tool might make it easier to keep your components under control. Using different colour wires will make it easier to remember which terminal is positive, and which is negative. This step should be relatively simple. Ensure that the hookup wires are able to pass through the hole that we drilled earlier. Remove the sticky adhesive from the back of the light strip, and attach to the booth. Close up of the mounted lights (and flash diffuser). My light strip refused to stay flat against the booth, particularly where the hookup wires were attached. 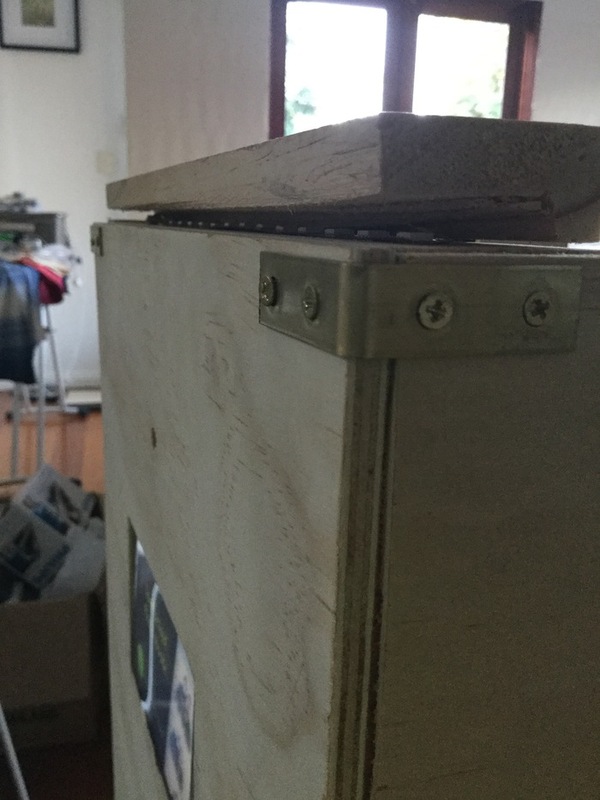 I fixed this with some wood glue, and clamping the stubborn section until the glue dried. 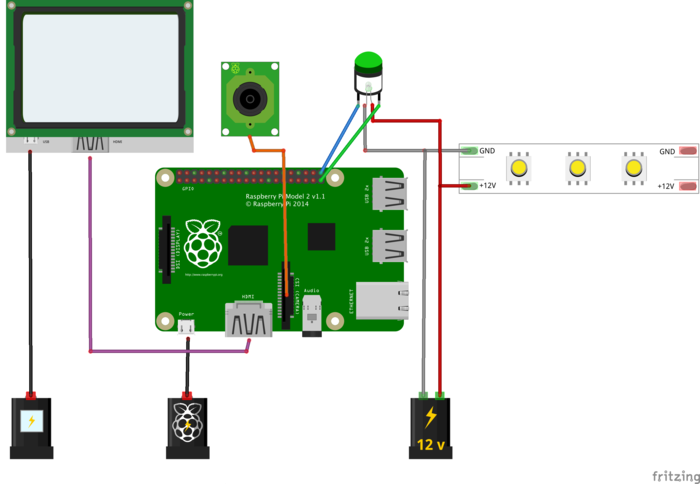 For the first version, I relied on multiple power adapters to provide each of the different voltages required by the circuit. 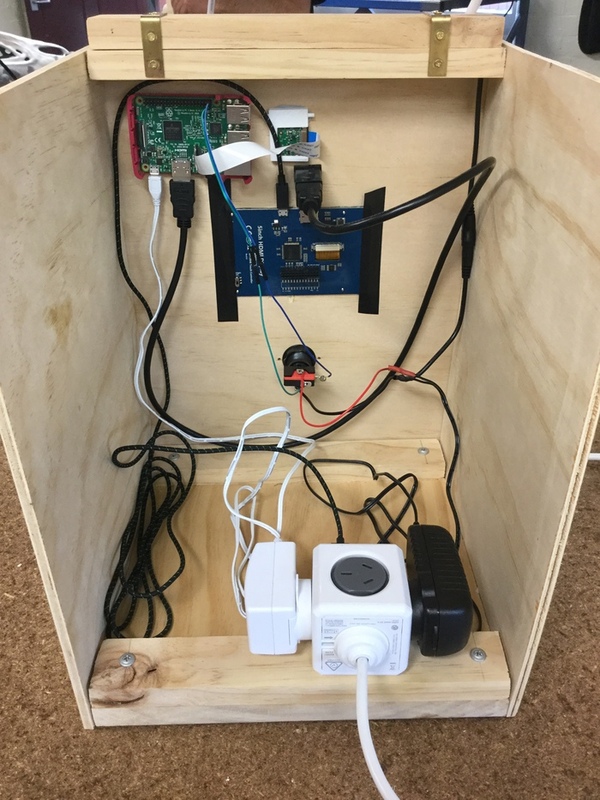 Note that (in my photo booth) the LEDs in both the arcade button & and LED strip include resistors which allow them to safely operate at 12v (your parts may vary). The circuit design can be improved so as to include only one power source. In a future post I intend to document this further. For the next article in this series, I’ll be talking about writing the code that will run on our photo booth.